Employers are obligated to act promptly when they learn about ongoing workplace sexual or racial harassment. When employers ignore workplace harassment, the public will find out. Media coverage is an important tool for exposing and fighting workplace racism and sexism. Media attention typically motivates employers to act quickly to remedy racial harassment to show the public that they take these issues seriously. An employer that acts promptly to correct the situation, in the face of this negative media attention, has an opportunity to foster a culture of tolerance, and potentially, to avoid liability for the harassment. However, when employers have knowledge of harassment and fail to act in the face of media coverage, their lack of concern for the victims of the harassment will be showcased for the public. Recently, the University of Illinois-Chicago came under intense public scrutiny for having knowledge of horrific racial harassment in its motor pool and failing to act. 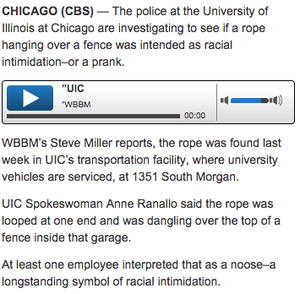 In February, 2014, the only African-American mechanic in UIC’s motor pool was horrified when he learned that a rope tied into a noose was left in the garage. Yet, despite the horrific nature of this act and the media coverage of it, UIC failed to remedy harassment in its garage. UIC continued exposing the victim to ongoing racial harassment at the hands of his coworkers, including having to walk past a racist doll every day at work, even after this incident, and having to listen to racist slurs and racist impersonations of African-Americans. Because the University failed to act, the media continued its coverage, when just a few months later, on August 11, 2014, two more radio broadcasts and a television news report aired, showing more examples of racist behavior in the garage. Instead of UIC publicly showing how it acted quickly to investigate and end the racial harassment in the motor pool, the public learned that African-Americans in the motor pool were subjected to racist slurs, racist impersonations of African-Americans, and racist items like a doll and a noose. When employers know about racial harassment, they have a duty to investigate and take measures to resolve it immediately. Employers who fail to correct the harassment when they first learn of it will be exposed to the public for this failure.